The Great Basin College Theatre Program will hold auditions for their fall production of She Kills Monsters, Tuesday and Wednesday, August 28 and 29 at 7 PM on stage in the Great Basin College Theatre. Interested actors will read from the script in a group audition. The production is open to Great Basin College students and juniors and seniors in high school. 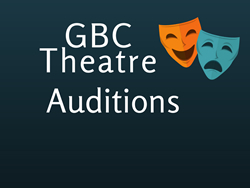 High school students must be enrolled in a GBC dual credit course or may enroll in an affordable GBC theatre course or community education course. Details will be provided at the audition. She Kills Monsters, by Qui Nguyen, is the story of a young woman who is mourning the death of her younger sister. She discovers her sister’s Dungeons and Dragons campaign and travels into the story to meet the sister she never knew. Complete with dragons, ogres and other flying creatures, actors will work with puppets, engage in stage combat and help to create a world above and below the surface of reality. Guest artists will join the GBC production staff in the creation of the puppets and the sets, providing a unique experience for actors and audiences alike. The production will be staged October 16 through the 20th. Rehearsals will be held in the evening. For more information contact John Patrick Rice at 775-753-2240 or john.rice@gbcnv.edu.